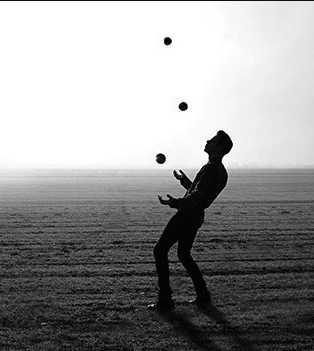 Back in the 80’s my friend Tim taught himself how to juggle. He would hitchhike with a sign tied around his waist saying where he wanted to go and he would juggle while standing at the side of road. He said getting rides was much easier that way. I suppose it made him a more interesting travelling companion than the run of the mill “thumb in the air” type. Tim inspired me to learn how to juggle, and I did. The other day I came across these juggling balls I’ve stored away for years (one is held together with duct tape thanks to my first dog, Lindsay). I’m not as good as I was, but I can still keep 3 balls in the air for a few seconds. According to a couple of websites, there are a number of benefits to juggling. The one that surprised me the most was that 280 calories/hour can burned while juggling. Now, that could be the result of chasing the balls that roll all over the place when dropped. The other benefits include improved concentration, reflexes and arm/shoulder mobility. It can also relieve stress and here’s my favourite – it can keep you away from snacking during periods of boredom (these juggling balls are staying on my desk from now on). It’s also a distraction for smokers who are trying to quit the habit. When I taught myself to juggle I started with 3 squash balls. Actually I started with 2 squash balls and I practiced by holding them both in my dominant hand and tossing one in the air and then the other before I caught the first one. When I got it working with my right hand, I switched to my left hand. One of the tricks was that I stood beside my bed so that when I missed catching a ball I did have to chase it around the room. What I remember was how stiff and sore my calves were the next day. I started with the 2 balls in my right hand and 1 in my left. I tossed one of the balls in my right hand into the air so it was on a trajectory to peak in front of my forehead. As that ball was enroute I tossed the ball from my left onto a similar trajectory with the goal of the catching the first ball with my left. As the 2nd ball was travelling the 3 ball left my right hand. My right hand caught the 2nd ball. At no time did my fingers leave my hand. There were a ton of failed attempts but I kept at it, and my body figured it out. Juggling is like riding a bike; once you get it you don’t lose it. There are all kinds of different patterns to learn. It really is an inexpensive and accessible way to exercise your body and your brain. Next time you need a distraction pick up 3 balls instead of your phone. Learning something new is always fun.